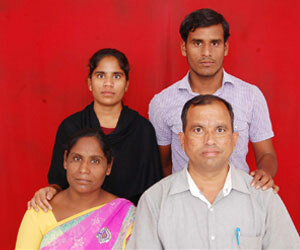 After I got saved, I was called to Bellary where I ministered for 8 years. Then I was let by God to come to Bangarpet as a Missionary. So I with my family came to Bangarpet on 1st July 2003 and got introduced to Greater Grace Fellowship. Ps. Bryan Coelho of Greater Grace Fellowship Bangalore came to Bangarpet and strengthened us by the Word of God. My wife and I our 3 children joined G.G.F in Bangalore, and became acquainted with the doctrines preached there, the life in the Body, and it’s been a great blessing to me and my family. I’m so thankful to God, I and my family are called to Greater Grace Ministry. We started a branch ministry of Greater Grace, here in Bangarpet on December 12, 2004. Pastor Bryan Coelho is a very good friend to me, but he is also my pastor. Bangarpet consists of 393 villages. Most of these villages are not reached with the Gospel. Our vision is, by the Grace of God, to reach these villages with the message of the Finished Work and also reach beyond to the other villages of the state of Karnataka. Every weekend we travel to villages, preaching the Gospel. God has also opened doors for discipling believers in the villages we have evangelized so far. We have seen the faithfulness of God in these places. We have 2 church services on Sundays in 2 villages, on in the morning and one in the evening. Please keep us in your prayers as we co-labour with you in His vineyard.